Today, health care providers have many container choices for sharps management, including reusable sharps containers that meet OSHA standard 1910.1030(d)(iii)(A) and are closeable, puncture resistant, leakproof and affixed with warning labels. 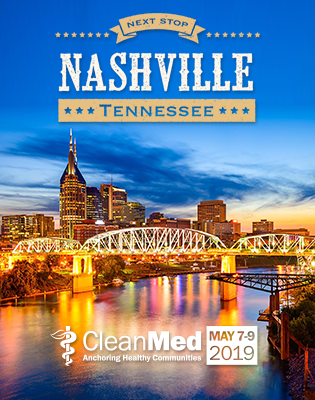 But in June 2015, a poster session at the Association for Professionals in Infection Control and Epidemiology annual conference stirred opinions in facilities of all sizes about the potential risk of transmission of C. difficile infections from reusable sharps containers. A press release led to the survey being quoted in mainstream publications. But reusable sharps containers have been safely used for years and offer a wide variety of environmental benefits too. For example, with these containers, Strong Memorial Hospital and Highland Hospital combined now annually prevent 126,485 pounds of CO2emissions by keeping 216,814 pounds of plastic and 9,600 pounds of cardboard from landfills.1 These numbers are equivalent to not burning 6,514 gallons of gas or 2,392 tanks of propane gas for barbecues. In its 2015 Sustainability Benchmark Report,2 Practice Greenhealth published that upon closer inspection of the survey there was an “overall lack of proper scientific methodology” ranging from “small sample size” to “failure to report bacterial loads or viral viability” to “failure to obtain separate samples from the interior vs. the exterior of the containers.” The organization’s advice is that hospitals should be careful to do their due diligence before any consideration of changing back to disposable sharps containers. For more on this issue, read “Sustainability Spotlight: Evolving Sharps Management” in the Winter 2016 issue of Greenhealthmagazine.